External hard drives are getting a lot smaller, and a lot cheaper. Two years ago, a 1 terabyte drive was about the size of a Mac Mini computer, and cost $1,000. These days they’re very much smaller and cheaper, as evidenced by the LaCie Rikiki Go external hard drive. It’s small. something like palm-sized, and packs either 500MB or 1 terabyte inside. By the way, ‘rikiki’ is a French word, meaning ‘tiny’. 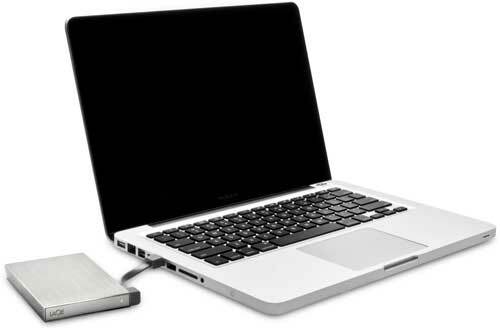 The case is made from brushed aluminium, making the hard drive both robust and good looking. No need to worry about misplacing the USB cable, on the Rikiki Go it’s attached. The 500MB LaCie Rikiki Go external hard drive has an RRP of $129, while the 1TB is $209 RRP. Included in the price of either size of Rikiki Go is 10GB of Wuala Secure Online Storage. Previous ArticleMB&F HM4 Thunderbolt watch… time flies?